The movie Pan's Labyrinth directed by Guillermo Del Toro tells the story of a young girl named Ophelia coming into contact with a different world. She lives in Spain during a time when Catholicism reign and Fascism was taking over. The world was fraught with strife as rebel forces fought to maintain their way of life. This move was laced with esoteric knowledge and critiques Fascism, Socialism, Catholicism and Capitalism. 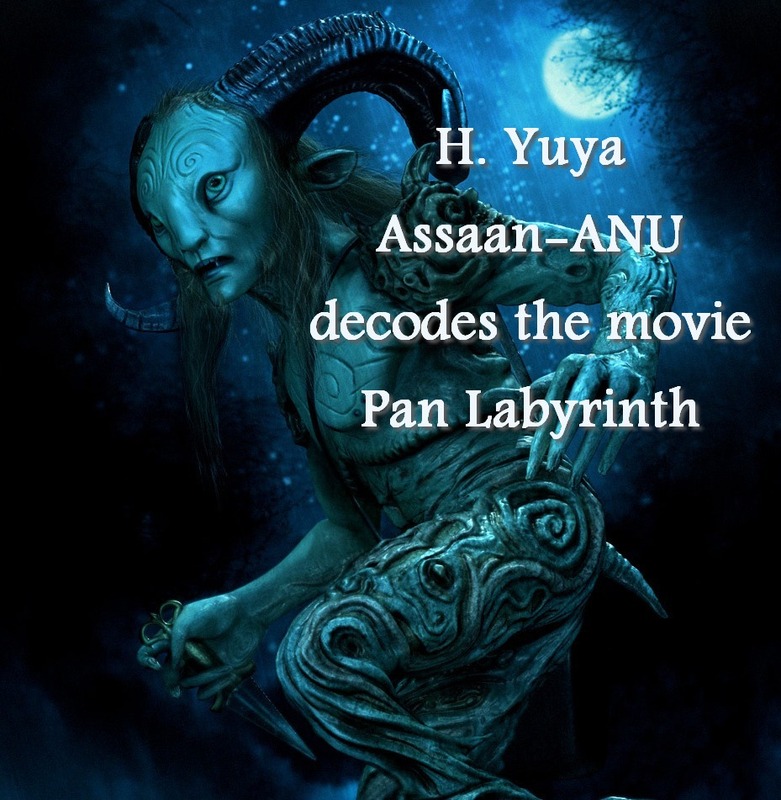 This week on Foundational Friday's H. Yuya Assaan-ANU decodes the movie Pan's Labyrinth and its connection to esoteric information of Valentine's Day. Pan correlates to Nimrod and Cupid whose name means desire. Pan is a sun energy seen as a creative force and regenerative force of the sun. This movie is a great example of one who understands true spirituality and the underlying meaning of things then you will also understand the underlying meaning of relationships, governmental structures and mundane life. This movie is based on the book The Great God Pan and it is a story of a scientist who tried to get a woman to have an experience with Pan in order to see the god. Years later they had a child and the child had mystical powers because she conceived the child with Pan. Pan's Labyrinth is about the changing of an era. The word Pan means one or unification and associates itself with the universe. Labyrinth or Labrys is formula for the golden mean and also means the double sided axe. It is a maze and in the center is either a Minotaur. The movie is set in the 1940s in Spain. The hero of the story, 12 year old Ophelia, is obsessed with fairy tales and mystical things. She travels to a mansion to live with her step father and her pregnant mother. The mother is very weak from her pregnancy and the driver pulls over so that the mother could catch her breath. Ophelia finds a statue of a faun and sees that the right is missing and she finds the eye and replaces it. This is the first symbol that is dealing with sight. It reminds us that when dealing with the realities of the third dimensional plane, one must look beyond the surface and see the spiritual significance of one's experience and things around them. Immediately after she replaces the eye a fairy appears though it just looks like a bug. Later Ophelia shows the fairy a picture of what she wants it to look like and it shapes shifts into that figure. This is another symbol dealing with perception and our control over it. The restoration of the right eye of the faun with the left hand is also a representation of Ophelia giving the occult the ability to see in a world of organized religion. This movie has so many symbols and it is incredible that Del Toro uses a young girl as the hero or HRU figure in the movie. But one symbol that is present is the self sacrifice in order to bring in the new order. It makes me wonder what does one need to sacrifice in order to usher in a new era in their life? I really enjoyed your decoding of Pan’s Labyrinth. I am actually from Slovenia but I love to watch Japanese anime, especialy Hayao Miyazaki’s movies. One of his masterpieces would be Princess Mononoke which is full of mysticism, Orishas, folklore and overall deep messages. I can see that you are very busy but I would not suggest something if it wasn’t a masterpice and worth of the attention.